Angie Walker is a few days from fulfilling a lifelong dream of being her own boss. Soon she and her best friend will open a treasure/antique business on Florida's east coast. But as a reporter for the Tequesta Sun, she has one last assignment - interview former boss Frederick Canterly about his five-decade career as publisher of the Madera Beach Tribune. The interview should be a piece of cake, but her former boss very inconveniently drops dead. Police believe he's been poisoned, and detectives find an incriminating vial in Angie's purse. Now instead of opening the door to her business dream, she may open the door to a prison nightmare. With the help of longtime friend and reporter Harry Landon, she begins a desperate search for the shrewd killer who framed her. Canterly made enemies during his time in Madera Beach. Many people hated him, with good reason. Even Landon had an opportunity and a very good motive to kill the Madera Beach publisher. While keeping her eye on her good friend Harry, Angie will have to shift through the evidence and find the ruthless murderer. In doing so she will also become a target. Unless she is careful, intelligent, and ruthless, Canterly will not be the only murder victim in this small, tightly knit community. 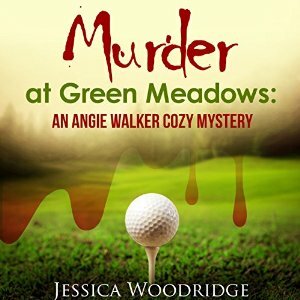 This is an easy, entertaining listen and a great beginning to a new cozy mystery series. The mystery itself is engaging as there are so many suspects to choose from. Frederick Canterly was a man who had made many enemies over the years, many of whom had ample opportunity and motive to kill him. Unfortunately for Angie, the murderer decided to frame her for the crime and she is the number one suspect for much of the story. The drama unfolds as she and her friend Harry Landon try to piece together the final few weeks of Fredericks's life; his business dealings and personal life that could hold the key to unravelling the mystery of who poisoned him. It's quite a straightforward murder mystery and there are no big twists and turns. It's not too difficult to guess who the culprit is but I thoroughly enjoyed relaxing with this novel and finding out in the end if I had guessed correctly. I would be happy to listen to more from the narrator, Laura Jennings, and read the next mystery in the series. I was gifted the audio book by the author via audiobookblast.com in exchange for an honest review.